Quality Air Heating and Air Conditioning > Articles > Air Conditioning > Is Air Conditioning Maintenance Really Necessary? Is Air Conditioning Maintenance Really Necessary? Before we get any further into this post, let’s just start off by saying that the answer to the question posited in the title above is: yes. You absolutely must schedule professional air conditioning maintenance on a regular basis. At least, that is, if you want to cool your home successfully while protecting the integrity of your home cooling system. A thorough AC tune-up entails much more than simply changing your air filter or spraying down the outdoor unit. 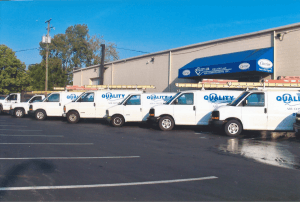 Air conditioning maintenance in Columbus, OH is a job for trained professionals only. That is why we recommend that you schedule service with the pros on our staff. Your air conditioner comprises many different parts and components. If any one of them is not capable of doing its job properly, then your system as a whole is going to suffer in its operation. It is going to require more energy for your air conditioner to cool your home if it is not well-maintained, which will result in higher energy costs. In addition to reduced energy efficiency, a poorly maintained air conditioner is also going to fail to cool your home as evenly and effectively as it ought to. This will likely leave you paying more to cool your home for a weaker cooling performance. We believe that you deserve better than that, don’t you. If your air conditioner is not regularly tuned up, it is also at a much greater risk of encountering operational problems. You don’t want your air conditioner to give out on you during the hottest time of the year, when it is obviously working its hardest. Avoid such problems by scheduling routine air conditioning maintenance with a member of our staff. Call Quality Air Heating and Air Conditioning today to get started.